Name Variation Carl Horatio Fraser was also known as Carol Horatio. Carl Horatio Fraser was born on 22 October 1899 at Calfornia. He was the son of Peter Daniel Fraser and Olive Corina Baer. Alfred Leroy Fraser was born on 21 January 1902 at Calfornia. [S243] U.S. Federal Census 1920 U.S. Federal Census, by Ancestry.com, Year: 1920;Census Place: Los Angeles Assembly District 66, Los Angeles, California; Roll T625_110; Page: 8A; Enumeration District: 270; Image: 694. Melvin Baer died on 30 November 1878 at Wisconsin. He was born on 30 November 1878 at Wisconsin. He was the son of Daniel Webster Baer and Celinda Daniels. Name Variation Margaret O. Grinnell was also known as Mattie O.
Margaret O. Grinnell was born circa 1861 at Wisconsin. She was the daughter of Henry Thomas Grinnell and Esther Ann Bear. As of 1905, Margaret O. Grinnell was never married. She died after June 1905. 1 June 1905 Spring Green, Sauk, Wisconsin Margaret O. Grinnell is listed as daughter on the census of 1 June 1905 in the household of Esther Ann Bear at Spring Green, Sauk, Wisconsin. [S246] U.S. Federal Census 1880 U.S. Federal Census, by Ancestry.com, Year: 1880; Census Place: Ithaca, Richland, Wisconsin; Roll 1445; Family History Film: 1255445; Page: 92A; Enumeration District: 236; . [S246] U.S. Federal Census 1880 U.S. Federal Census, by Ancestry.com, NA Film Number T9-1446 Page Number 232C. Lettie J. Grinnell was born circa 1866 at Illinois. Charles Andrew Grinnell was born on 18 October 1872 at Illinois. He was the son of Henry Thomas Grinnell and Esther Ann Bear. Charles Andrew Grinnell married Mary Warner before 1897. In 1880 census, reported as suffering from dropsy. Hattie A. Grinnell was born circa August 1875 at Illinois. Hattie A. Grinnell died on 16 February 1882 at 6hy 6m. She was buried after 16 February 1882 at Spring Green Cemetery, Spring Green, Sauk, Wisconsin. Georgie Grinnell was born circa October 1863. Georgie Grinnell died on 9 January 1865 at 1y 3m. 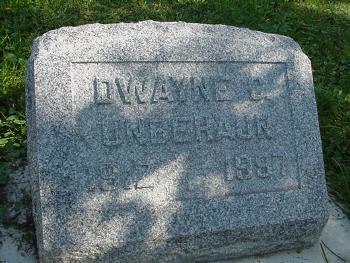 He was buried after 9 January 1865 at Spring Green Cemetery, Spring Green, Sauk, Wisconsin. Married Name before 1897 As of before 1897,her married name was Grinnell. Mary Warner was born in 1875. She married Charles Andrew Grinnell, son of Henry Thomas Grinnell and Esther Ann Bear, before 1897. Esther Marie Grinnell was born on 24 February 1897 at Minnesota. She was the daughter of Charles Andrew Grinnell and Mary Warner. Name Variation William Sylvester Davis was also known as W. S.
William Sylvester Davis was born on 5 February 1858 at Richland, Wisconsin. He was the son of Silas Coe Davis and Angeline W. Bear. William Sylvester Davis married Edith Richards, daughter of (?) Richards and Mary J. (? ), circa 1885. William Sylvester Davis died in 1914. 1 March 1895 Waco, Sedgwick, Kansas William Sylvester Davis appeared on the census of 1 March 1895 at Waco, Sedgwick, Kansas. [S248] U.S. Federal Census 1860 U.S. Federal Census, by Ancestry.com, Year: 1860; Census Place: Olathe, Johnson, Kansas Territory; Roll M653_350; Page: 453; Image: 5; Family History Library Film: 803350. [S247] U.S. Federal Census 1870 U.S. Federal Census, by Ancestry.com, Year: 1870; Census Place: Ithaca, Richland, Wisconsin; Roll M593_1734; Page: 644B; Image: 192; Family History Library Film: 553233. [S245] U.S. Federal Census 1900 U.S. Federal Census, by Ancestry.com, Year: 1900; Census Place: Waco, Sedgwick, Kansas; Roll: T623_499; Page: 2B; Enumeration District: 275. [S244] U.S. Federal Census 1910 U.S. Federal Census, by Ancestry.com, Year: 1910; Census Place: Waco, Sedgwick, Kansas; Roll: T624_455; Page: 12B; Enumeration District: 0099; Image: 1321; FHL Number: 1374468. Name Variation Albert Clay Davis was also known as B. C.
Albert Clay Davis was born in May 1870 at Wisconsin. Albert Clay Davis married Angeline Blanche Anderson circa 1895. Albert Clay Davis died in 1947. 1 March 1895 White Rock, Lane, Kansas Albert Clay Davis appeared on the census of 1 March 1895 at White Rock, Lane, Kansas, living next door to S. C. Davis. Jay Clayton Davis was born on 18 July 1872 at Wisconsin. Jay Clayton Davis married Matilda A. Pomrenke circa 1900. Jay Clayton Davis died on 7 July 1952 at Los Angeles, California, at age 79. 1 March 1895 White Rock, Lane, Kansas Jay Clayton Davis appeared on the census of 1 March 1895 in the household of Albert Clay Davis at White Rock, Lane, Kansas; living next door to S. C. Davis. [S245] U.S. Federal Census 1900 U.S. Federal Census, by Ancestry.com, Year: 1900; Census Place: White Rock, Lane, Kansas; Roll: T623_485; Page: 4A; Enumeration District: 124. [S244] U.S. Federal Census 1910 U.S. Federal Census, by Ancestry.com, Year: 1910; Census Place: Wichita Ward 6, Sedgwick, Kansas; Roll: T624_456; Page: 4A; Enumeration District: 0143; Image: 673; FHL Number: 1374469. [S243] U.S. Federal Census 1920 U.S. Federal Census, by Ancestry.com, Year: 1920;Census Place: Pomona Ward 3, Los Angeles, California; Roll: T625_118; Page: 16B; Enumeration District: 593; Image: 923. [S250] U.S. Federal Census 1930 U.S. Federal Census, by Ancestry.com, Year: 1930; Census Place: South Gate, Los Angeles, California; Roll: 171; Page: 11B; Enumeration District: 1343; Image: 189.0. Eunice Cornelia Davis married (?) Cooper. Eunice Cornelia Davis was born on 1 July 1874 at Wisconsin. She was the daughter of Silas Coe Davis and Angeline W. Bear. Eunice Cornelia Davis died on 2 September 1952 at Ventura, California, at age 78. George W. Davis was born on 18 April 1877 at Wisconsin. George W. Davis died on 29 May 1898 at age 21. 1 March 1895 White Rock, Lane, Kansas George W. Davis appeared on the census of 1 March 1895 in the household of Silas Coe Davis at White Rock, Lane, Kansas; living next door to B. C. Davis. Name Variation Oscar W. Carlson was also known as Johnson. Oscar W. Carlson was born on 28 November 1896. He was the son of Peter Johnson and Benedikta Goranson. Oscar W. Carlson married Daisy Violet Baer, daughter of Henry Clay Baer and Elizabeth Matilda Schambaugh, on 23 March 1933. 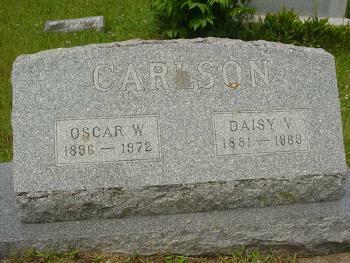 Oscar W. Carlson died on 1 April 1972 at age 75. He was buried after 1 April 1972 at Pine River Cemetery, Richland, Richland, Wisconsin. Frank Davis was born circa 1864 at Wisconsin. Frank Davis died before April 1948. Samuel S. Davis married Eunice Coe. Samuel S. Davis was born in 1799. Eunice Coe married Samuel S. Davis. Eunice Coe was born in 1802. Peter Johnson married Benedikta Goranson. Benedikta Goranson married Peter Johnson. Married Name 14 May 1893 As of 14 May 1893,her married name was Baer. Laura Estelle Grover was born in October 1872 at Wisconsin. She was the daughter of George D. Grover and Mary Jane Wright. Laura Estelle Grover married Leroy Charles Baer, son of Henry Clay Baer and Elizabeth Matilda Schambaugh, on 14 May 1893. Laura Estelle Grover died in 1937. 1 June 1905 Kenosha, Kenosha, Wisconsin Laura Estelle Grover appeared on the census of 1 June 1905 in the household of Leroy Charles Baer at Kenosha, Kenosha, Wisconsin. Laura Estelle Grover had 1 with 1 living in 1900 children. She had 1 with 1 living in 1910 children. [S245] U.S. Federal Census 1900 U.S. Federal Census, by Ancestry.com, Year: 1900; Census Place: Richland, Richland, Wisconsin; Roll: T623_1813 Page: 5B; Enumeration District: 119. [S244] U.S. Federal Census 1910 U.S. Federal Census, by Ancestry.com, Year: 1910; Census Place: Mckinley, Polk, Wisconsin; Roll T624_1733; Page: 3A; Enumeration District: 165; Image: 272. Name Variation Earl Henry Baer was also known as H. Earl. Name Variation Earl Henry Baer was also known as Henry Earl. Name Variation Earl Henry Baer was also known as Earl. Earl Henry Baer was born on 8 December 1895 at Wisconsin. He was the son of Leroy Charles Baer and Laura Estelle Grover. Earl Henry Baer died on 7 May 1957 at Minnesota at age 61. 1 June 1905 Kenosha, Kenosha, Wisconsin Earl Henry Baer appeared on the census of 1 June 1905 in the household of Leroy Charles Baer at Kenosha, Kenosha, Wisconsin. Carl M. Baer was born on 14 August 1908 at Wisconsin. He was the son of Elroy Clifton Baer and Elsie Adeline Grover. Carl M. Baer died on 18 February 1976 at age 67. Adopted after the 1910 census, and before the 1920 census; Birth Name William Smith prior to being adopted by the Baer's. [S243] U.S. Federal Census 1920 U.S. Federal Census, by Ancestry.com, Year: 1920;Census Place: Mckinley, Polk, Wisconsin; Roll T625_2010; Page: 1A; Enumeration District: 157; Image: 461. [S250] U.S. Federal Census 1930 U.S. Federal Census, by Ancestry.com, Year: 1930; Census Place: McKinley, Polk, Wisconsin; Roll 2605; Page: 2B; Enumeration District: 27; Image: 981.0. George D. Grover married Mary Jane Wright. George D. Grover was born on 31 March 1848 at Ohio. He died on 16 June 1911 at Wisconsin at age 63. Mary Jane Wright married George D. Grover. Mary Jane Wright was born on 28 June 1850 at Wisconsin. She died on 17 February 1931 at Wisconsin at age 80. Name Variation Beulah I. Baer was also known as Lockvich. Beulah I. Baer was born on 26 February 1905 at Wisconsin. She was the daughter of Elroy Clifton Baer and Elsie Adeline Grover. Beulah I. Baer died on 15 February 1919 at influenza at age 13. Birth Name Ida Lockvich - Adopted by Baer's 14 Oct 1906. [S244] U.S. Federal Census 1910 U.S. Federal Census, by Ancestry.com, Year: 1910; Census Place: Mckinley, Polk, Wisconsin; Roll T624_1733; Page: 2A; Enumeration District: 165; Image: 270. Name Variation Edna Lucile Baer was also known as Lockvich. Edna Lucile Baer was born on 26 February 1905 at Wisconsin. Edna Lucile Baer died on 11 February 1919 at influenza at age 13. Birth Name Mary Lockvich - Adopted by Baer's 14 Oct 1906. Name Variation Iva Benita Baer was also known as Bennett surname prior to adoption. Iva Benita Baer was born on 12 August 1914 at Wisconsin. Iva Benita Baer died on 25 February 1995 at Minnesota at age 80. Dwayne Carl Unbehaun was born on 6 October 1912. Dwayne Carl Unbehaun married Loretta Cecelia Bosch on 5 June 1936. Dwayne Carl Unbehaun died on 26 February 1997 at age 84. He was buried after 26 February 1997 at Richland Center Cemetery, Richland, Richland, Wisconsin.